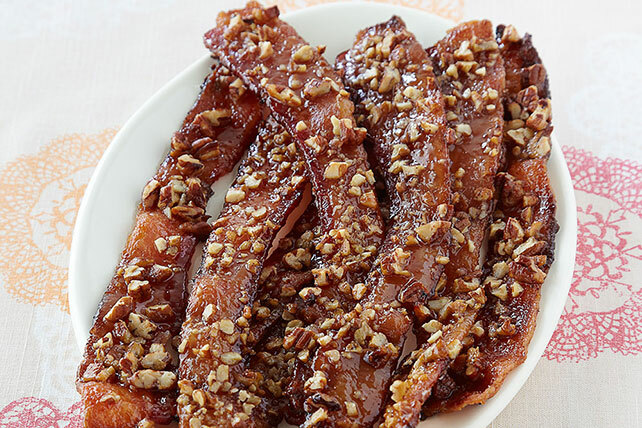 As if bacon weren't already one of life's most profound pleasures, this recipe adds nutty and spicy to the mix with brown sugar, Dijon mustard and pecans. Place bacon, separated into strips, on foil-lined rimmed baking pan. Mix sugar and mustard; spread or brush on bacon. Top with nuts. For a little heat, prepare as directed adding 1/2 tsp. ground red pepper (cayenne) to the brown sugar mixture before coating the bacon. Store unopened packages of bacon in the refrigerator until the "Use by Date" stamped on the package. Once opened, wrap tightly and refrigerate up to 1 week. To freeze bacon, wrap the unopened, vacuum-sealed package tightly in freezer-safe material, then freeze up to 1 month. Thaw in refrigerator before using.